linguist (1786-1859). Clipped signature. Göttingen. 1 p. 34:125 mm. From the collection of Diana Herzog. Grimm, Wilhelm (1786–1859), German author, the younger of the Brothers Grimm. ALS („Wilh. Grimm“). [Kassel, February 1838]. 4°. 1 p. on double leaf. 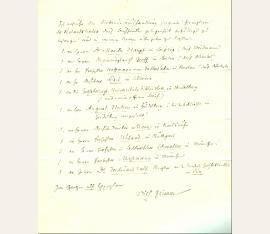 Fine letter to the Dieterichsche Buchhandlung in Göttingen, asking for sending some copies of „The Song of Roland“ to 11 addressees, among them Hoffmann von Fallersleben and Ludwig Uhland. – Grimms edition of the „The Song of Roland“ – the oldest surviving major work of French literature – was published by Dieterich the year before. 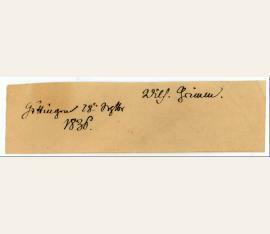 The letter was written in that year, when the Brothers Grimm, who belonged to the „Göttingen Seven“, have been relieved of their positions and went to Kassel. – The reverse of fol. 2 with collection stamp Gottfried Doehler (1863–1943), the first administrator of the National Collection of books and engravings at Greiz. Grimm, Wilhelm (1786–1859), German author, the younger of the Brothers Grimm. ALS. Berlin, July 28, 1848. 4°. ½ p. on double leaf. With autogr. address. 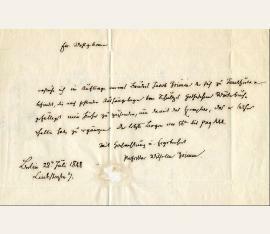 To a bookseller in Magdeburg, requesting on behalf of his brother Jacob the missing proof sheets of „Schulzes gothisches Wörterbuch“. 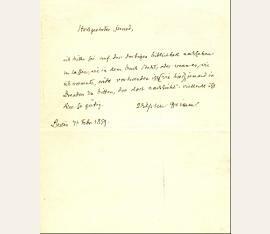 – Somewhat browned due to paper, and some damages to edges; tiny tears from opening the letter re-backed. Grimm, Wilhelm (1786–1859), German author, the younger of the Brothers Grimm. ALS. Berlin, February 7, 1859. Small 8°. ½ p. on double leaf. Requesting a friend to look something up at the library in Dresden.